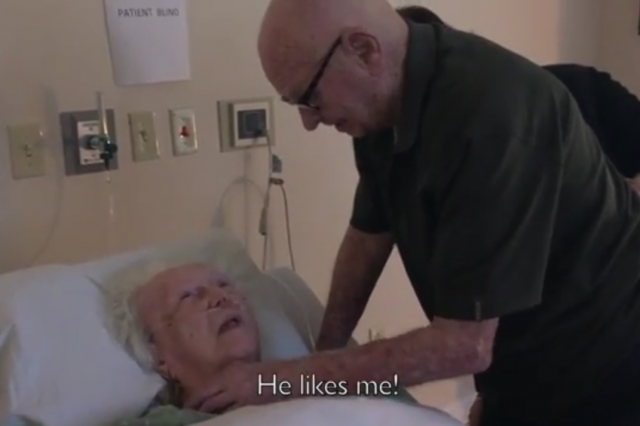 Those of a gentle disposition prepare to reach for the Kleenex as you watch the heart melting moment a 92-year-old man sings to his dying wife. Laura found comfort in the tune and when her husband returned home to her they would regularly sing it together at a variety of events, including their 50th wedding anniversary. Sadly Laura was in a hospice at the time of filming, and suffering from blindness caused by macular degeneration, but there is obviosuly nothing wrong with her hearing as she declares “He likes me”. It is a beautiful moment, where you’d forgive everyone on screen for being far sadder than they allow themselves to be, but instead it is a reflection of the joy they have found with one another over the years. According to Erin Solari’s description on YouTube, her grandmother was deemed fit to be sent home from the hospice to see out her final days surrounded by family, and so far she is still with them. Hopefully Howard will get to share the song at least once more and Laura will ‘know’ precisely how he feels.